features 10 days of food and fun! PIZZA AND PANCAKES, lobster and cheesecake, microbrews and mango lassi — these are a few of the favorite food items you’ll find at the 2018 Burlington Restaurant Ramble running May 18-27 in Burlington, New Jersey. 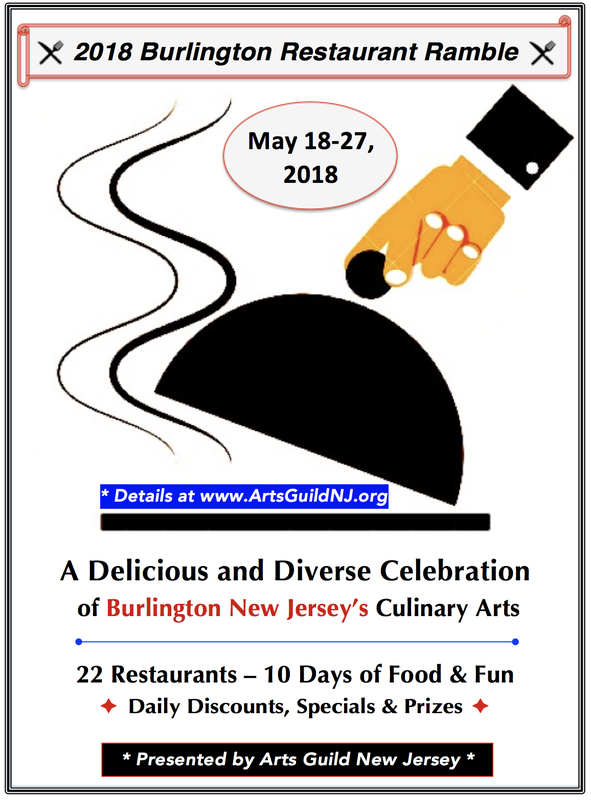 Presented by Arts Guild New Jersey, Burlington Restaurant Ramble is a 10-day, two-weekend invitation to sample the top-quality cuisine of 22 area restaurants, bakeries, coffee shops, pubs and ice cream parlors. 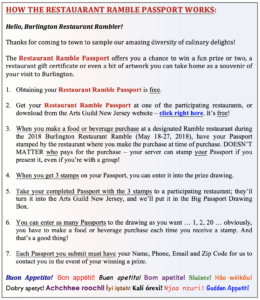 From May 18-27, when a customer makes a food or beverage purchase at a participating Restaurant Ramble eatery, they receive a stamp on a Restaurant Ramble Passport; three stamps from three eateries, and the Passport can be entered into a drawing for prizes. Each restaurant will have its own specials and discounts throughout the 10 days. * There is no cost to obtain a Restaurant Ramble Passport, which can be downloaded for free right here. CHECK OUT the * 2018 Restaurant Ramble Passport * and make plans now to visit your favorite Burlington eateries! Amy’s Omelette House * Antiques Emporium * Arts Guild NJ * Attic Articles * B-Uno’s * Blue Claw Seafood * Brickwall * Clique Salon * Curtin’s Wharf * Doc’s Pub Irish Sports Bar * Edmar Bar & Restaurant Supply * Evermore Coffee Roasters * Francesco’s Pizzeria & Restaurant * Fratelli’s Italian Restaurant * J. Paglione Tailor Shop * J & B Bakery * Legends Gourmet Pizza * Lily Inn * LoFi Books, Records & Coffee * Lyceum Hall Center for the Arts * Olde City Quilts * R & H Custom Frames * Rattan Patio & Furniture Shop * Revolution Barbershop * Rino’s Penn Pizza Palace * Riverview Restaurant * Rose of Sharon Christian Bookstore * Tolliver’s Florist * Ummm Ice Cream * Villa Rosa Ristorante & Pizzeria * Virtu Women’s Clothing * Vutt Optical & Sunglasses * Waitz Jewelry * Whole Armour Christian Apparel * Y & V Jewelry ….. MORE TO COME! !